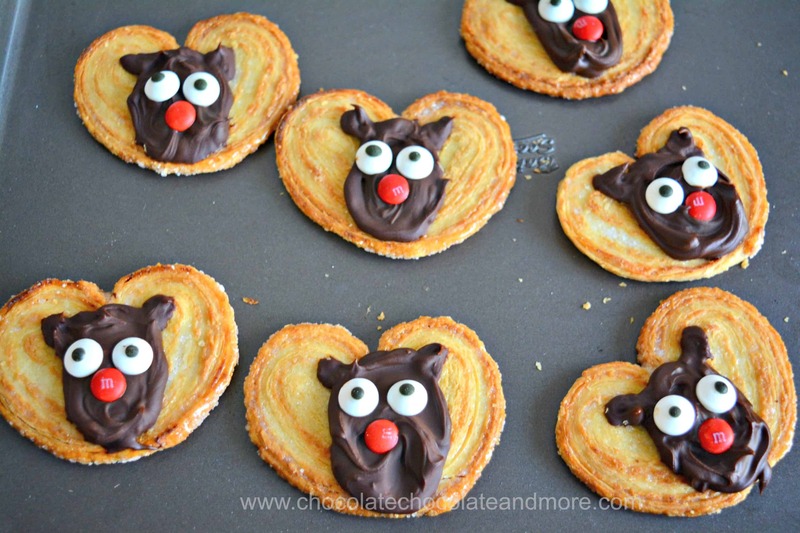 Moose Palmiers - Chocolate Chocolate and More! 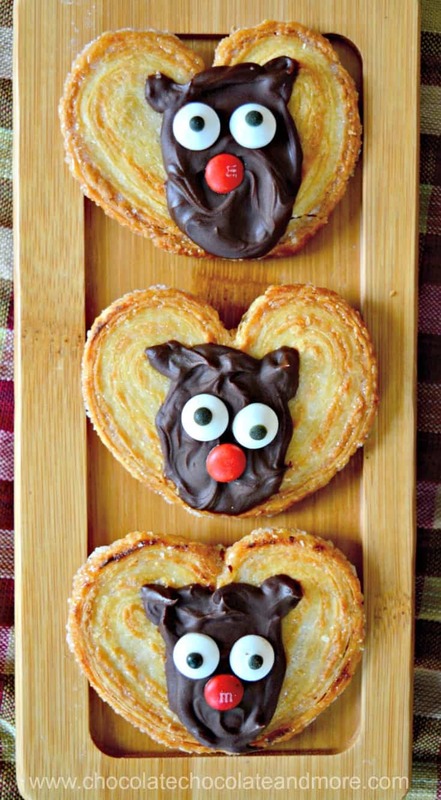 Moose Palmiers are a fun treat for the kids. Embellish store bought palmiers for a quick party treat or decorate homemade ones. Becky is coming home from college tonight. I haven’t seen her since I left for Cambodia so I’m really excited. She’s also bringing her boyfriend. I’ve not met him yet so there’s that new experience. I thought I’d surprise them with some treats. It’s been really busy so I didn’t have a lot of time to throw things together. That’s always the case at this time of year isn’t it? Palmiers are one of my favorite cookies. I love the caramelized sugar and flakey pastry together. The grocery store had some palmiers on sale so I snagged a box. As I looked at them, they kind of reminded me of moose horns. It’s the time of year when they could be reindeer antlers too. I also need to clean out my fridge so I can stuff it again. I’m roasting a turkey for Christmas day and baking some more desserts. I happened to have some ganache in my fridge so I used that for these cookies. Ganache can be pretty hard when it’s refrigerated. Mine was already in a ziplock bag. The end of the bag was clipped because I used it to decorate some cookies. I softened it by putting the bag of ganache in a second bag, sealing it, and setting it in some hot water for a few minutes. Once it was soft, these moose palmiers went together fast. I squeezed out ovals of ganache onto the palmiers and smoothed them with a spoon. You could just use a spoon to make the ovals. No need to be perfect, these cookies will disappear too fast for anyone to notice any imperfections. Put ganache in a ziplock bag and cut about 1/8 inch off the corner. Squeeze ganache into an oval in the center of each palmier. Add ears by squeezing small ovals in the ear positions. 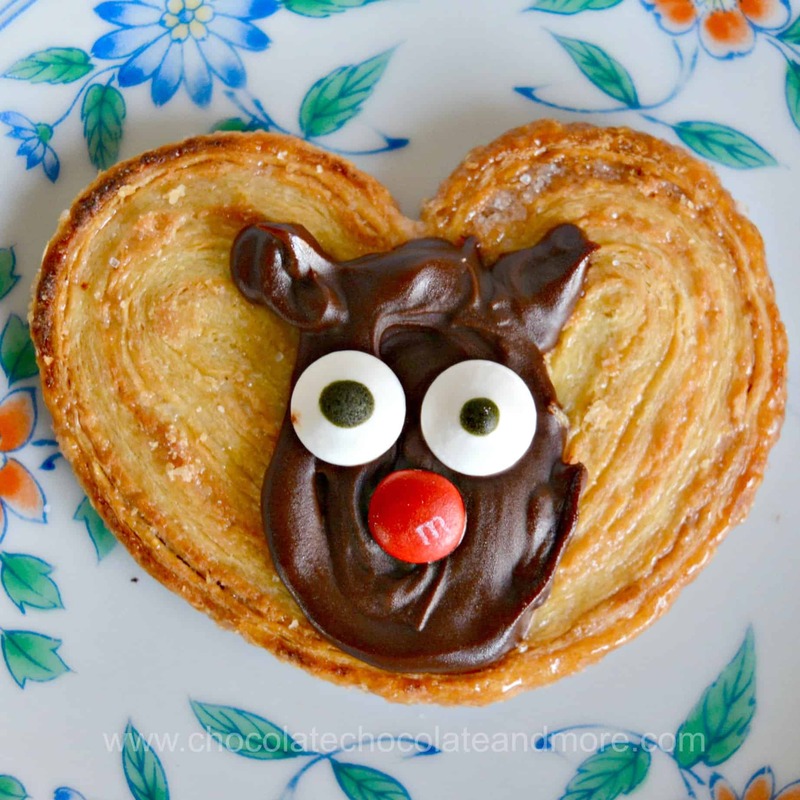 While the ganache is still warm, place the eyeballs. Then place the red M&M where the nose should be. Refrigerate until ganache is set about 30 minutes.